Sample AngularJS/HTML5 project with source code. PHP/SQLite backend. 2. Use <daypilot-scheduler> element to include the Scheduler in the page. DayPilot includes AngularJS bindings that expose the API using an AngularJS directive. 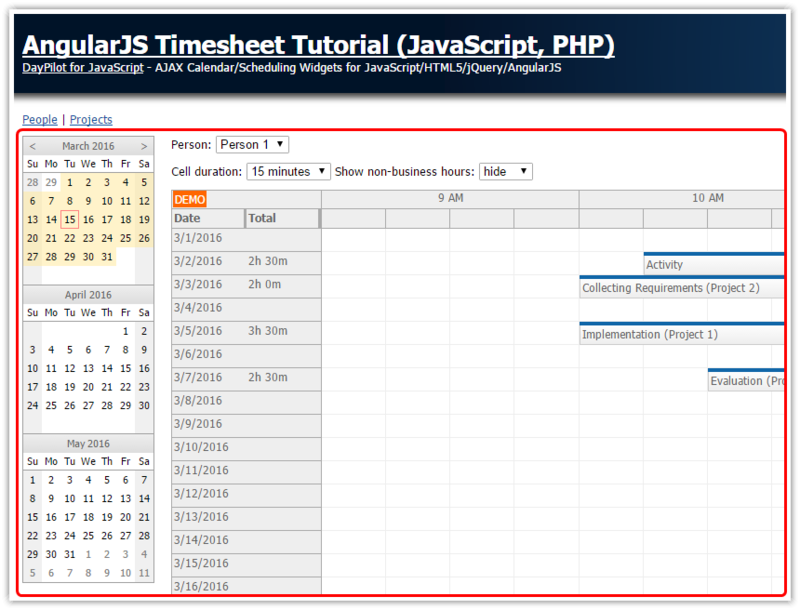 We will display the timesheet using AngularJS Scheduler control, configured to load days as rows. You can switch the Scheduler to the timesheet mode using viewType property of the config. The default configuration uses one cell per hour which is not usually the best scale for the timesheet. We will use 15-minute cells for the initial view and make the value configurable using a drop-down list later. We will add a second time header row which will correspond to the grid cells. We will keep it empty using format = "" (empty string) but you can use a custom date/time format string. The next step will be to hide cells that are outside of the normal business hours. Typically, it is 16 hours per day and it would take 2/3 of the available space. The timesheet grid is now ready and we can display the records. We will add an "events" attribute to the Scheduler directive in the HTML view to point it to the scope variable that holds the timesheet records. We will load the records/events using a special AJAX call (using AngularJS $http helper). As soon as we assign the data to the "events" property the Scheduler will be updated automatically. Now we will add another row header column and use it to display daily summaries. We will calculate the daily totals on the client side, using onBeforeRowHeaderRender event handler. Note that the additional columns are accessible using args.row.columns array. This array doesn't include the default column (which can be reached using args.row.html) so the second column will have index 0. As soon as the users changes the selected value, onSelectedPersonChanged() method will be executed. It calls an update loadEvents() method which loads the filtered records from the server. The users will need to change the visible month. 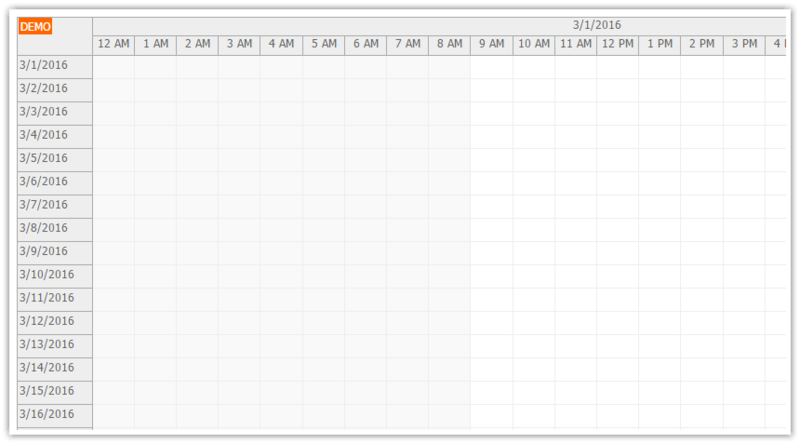 We will add a Navigator control which displays a small monthly calendar and bind it to the Scheduler. We need to change our loadEvents() method to read the current date selection from the Navigator (so it can be passed to the backend_events_resources.php script) and also change the visible range when receiving the response. We could also change the visible range ($scope.scheduler.startDate, $scope.scheduler.days) right away but it would cause an unnecessary Scheduler update. It will be possible to edit the records by clicking on them. We will add this functionality using onEventClick event handler. The event handler opens a special page (edit.html) using a modal dialog. Adding the drag and drop moving support is easy. In fact, it is enabled by default. All we have to do is to handle onEventMoved event and notify the server about the new record position. The same applies to drag and drop resizing. At this moment we have a complete view that displays the timesheet for the selected person. We are also tracking the project reference for each timesheet record and we want to add another view which will display all records for a given project. So we add a master page (index.html) which will use the existing timsheet (people.html) as one of the views. The navigation between the views will use ngRoute AngularJS plugin. 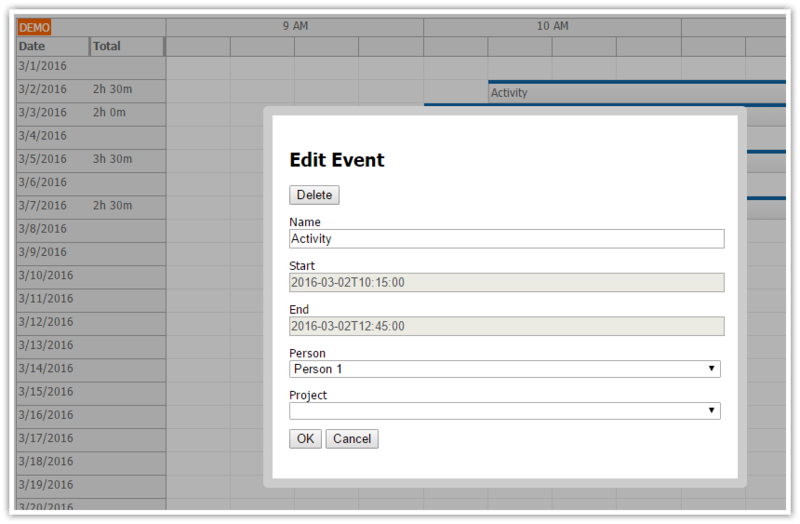 The projects timesheet view displays details for a selected project. The timesheet records are displayed in rows, one per person. We will use the AngularJS Scheduler control again, this time in the standard view which displays one resource (person) per row. The horizontal (X) axis is extended and it displays the full date range as specified using .days property. Note that we are loading the resources and events using two separate AJAX requests but we wait for both to complete before updating the Scheduler. The sample project uses an SQLite database. The database file will be created automatically if daypilot.sqlite file is missing (see the definition in _db.php file). Note that you need to enable write permissions for the database file.